Damn good thing it's not whiskey I smell, sir! Sir Arthur C. Clarke, the British author and inventor known for visionary science fiction novels like ‘2001 A Space Odyssey’, ‘Mysterious World’ (1981) and many more, died on 18th March 2008, where a large number of sympathizers paid their last respects to this once great science fiction writer. Among them were his immediate family Sir Arthur’s brother Fredrick (Fred) Clarke, sister Mary who lives in London, Fiona, (Mary’ daughter) who lives in New Zealand, the late Michael Clerk’s daughter Mary Anne (Mrs. Johnson) who lives in New Zealand and Fred Clarke’s daughter Diane who also lives in New Zealand. 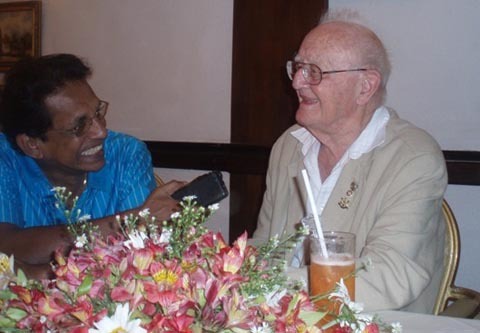 Just after their week’s stay at the Galle Face Hotel in Colombo during and after the funeral, Fred Clarke had a pow-wow with Dr. Tilak S. Fernando. Fred is a charming, quick witted and friendly Englishman which made the whole interview punctuated with rows of laughter most of the time. To put into words such an experience needs a publication in book form. The following is a summarized version of the interview with the brother of the world famous Sir Arthur C. Clarke. Q: How ‘young’ are you now Fred….? A: ‘What am I ….? 87 ……. and mentally 15! Q: How many members were there in your family? A: Four – three boys and a girl. Arthur, sister Mary, the late brother Michael and self. Q: How memorable was your childhood? A: Arthur was about 14 years old and I was ten when our father died of cancer after coming out of the World War (between 1914 - 1918). We had a farm but from the time father got ill and later died, my mother was left with a derelict farm, empty bank account, four hungry children and she had to pick the threads up from there. But of course, she gave a good education for a start to Arthur, who became a Civil Servant first. I joined the Post Office, Mary got married and Michael, the poor devil had to carry on with the farm. Q: Weren’t you also involved in journalism at one time? How did you come into journalism at the beginning? A: Yes I did write to various organizations and sports clubs in Taunton and printed a little booklet which I managed to sell for old six pennies. This was triggered by a lady who was living in Taunton writing to the local newspaper complaining that in Taunton there was hardly anything to do! Q: How far did you succeed in journalism? A: When I was writing to the Rotary Club newspaper, its editor was called up to the War and editorial responsibilities were thrust upon me. Q: So, do you think journalism was bestowed upon your family naturally? Q: Didn’t your mother also write a book? A: Yes. When my mother was getting older I used to take her for a horse ride in the evening. She worked with horses all her life, looking after the farm in her young days to bring us up. It was a time after the war, and as a consequence of petrol rationing, not many used motor cars but hired a horse for transport. That was how she brought us up. During her latter years when I took her for a ride she always came out with some interesting story about a place or incident of those various places we visited. So one night I told her to jot down all her experiences on a note book, which she did, and after a month she had 100 different stories. I typed them all out and gave the script to a friend who was an editor of a local newspaper to read and later published it. Q: What was the name of the book your mother published? A: ‘My four feet on the ground’. The front cover had a picture of mother sitting on a horse. Wherever she went those days she was always on a horse. Q: How was your Army career and what made you enlist in the Army? A: One cold night I was waiting in the railway station for the train to arrive and I saw four ex-soldiers on the platform. They were drenched and did not know which country they were in. We were expecting Germans to arrive those days at any time. However, I helped them out, and on the following day went up to the recruiting office and joined the Army. But most of my time was spent in the jungles of Burma and India. I loved the war! Q: When did you come out of the Army? A: In 1946. I came straight to London and met a girl called Dorothy and married her. Or she married me..!.... (laughter)… At that time Arthur was in a tiny room in London by himself. When I got married we had no place to live, so Arthur suggested that if he were to buy a house, whether Dorothy and I could move in with him and look after the house. Q: Where was that house? When we were living at Nightingale Road Arthur introduced Bodhinayakes to me and they came and lived with us in the same house. Subsequently when Arthur wanted to move out to Sri Lanka I bought the house from him and when I decided to move out to my native village, Somerset, I sold it to Karuna. Q: What did you do for a living after your army career? A: I worked as a Heating Engineer and have many hilarious experiences to relate. Q: Now that your brother Arthur is no more among us, will you be taking an active role in the Sir Arthur C. Clarke Foundation? A: As I said before, I am too old for that now. What am I? 87….! Still feel 15 years old mentally. Major part of its responsibility will be taken care of from a base in Washington as Americans have a leading role in it. My daughter Angela is on the Board from London. Q: What plans have they made to carry forward what Sir Arthur has been doing up to his last moments? A: Part of Sir Arthur C. Clarke Foundation’s aim is to encourage young people to write, which I am doing. I have been running a number of youth clubs for many years and I find that youngsters today of 12-14 years have terrific imaginations. I am collecting some of their ideas and their inventions. Q: Are you arranging someone to write Sir Arthur’s biography? A: It has already been done by some American named Brown. But I am trying to get it updated incorporating what has taken place in the past four years. Q: Don’t you think it’s a good idea to have a Sir Arthur C. Clarke’s museum in Somerset, in your own native village in the UK where all his trophies, awards, pictures, your family photographs, underwater equipment he used etc., could be displayed for people from all four corners of the world to visit and see and appreciate what Sir Arthur contributed to mankind during his life time? A: It’s a wonderful idea. I am working on it with someone in Somerset to have it in a small scale to display his books, photographs of his trophies etc. Of course, he lost most of his underwater equipment during the tsunami in Sri Lanka. Q: Why do you say you want to hang photographs of his trophies etc. and not the real trophies? A: They are in Barnes Place (in Sri Lanka). I expect they want to keep them there. Q: Was Sir Arthur’s last will read out to the family while you were here, after the funeral? A: No, we have not seen it yet. But I know Arthur has made arrangements well in advance, about 10 years ago on that score. He has already gifted many things to the Moratuwa University. Q: Have you got any memorable events with your brother Arthur? A: Yes. It was during a seminar that Arthur was on his wheel chair chatting to various people. I saw from a distance a young lady talking to him while Arthur was seated in his chair. After a while I bumped into her from a different direction walking towards her. She was so shocked to see me, thinking it was Arthur (they say we look alike a lot) she exclaimed, ‘Good heavens! You have made a speedy recovery….! On another occasion when Arthur took part in the film 3001 there were over 200 press men and women to cover the incident and at the end of all the interviews Arthur completely lost his voice and had to abandon the shooting of the film on that day. Q: How many children have you got?